Showing its age in all the right places. Plantation Rum is owned by French Cognac producer Maison Ferrand, who control no less than a dozen major brands of premium spirits and liqueurs. Sometimes that is an iffy proposition, but not in this case because the folks at Ferrand are all about quality … and you can taste it. Plantation Rum is their top shelf Rum label, and mighty good stuff it is, too. Plantation offers a variety of Rums from the Caribbean which vary between soft and aromatic to light and elegant … each one showing the gentle, experienced influence of Maison Ferrand. The secret to Plantation Rum Barbados Old Reserve 2001 is time. Lots and lots of time. The 2001 vintage is molasses-based and was fermented for three full days and distilled in copper pot stills. It was aged in ex-Bourbon casks for eleven years in the tropics where aging is accelerated. Then it was aged two more full years in France in those incredible ex-Cognac casks. If you are a Rum fan, do we need to say any more? 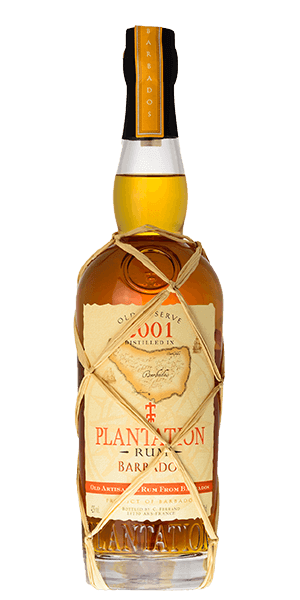 What does Plantation Rum Barbados 2001 taste like? The Flavor Spiral™ shows the most common flavors that you'll taste in Plantation Rum Barbados 2001 and gives you a chance to have a taste of it before actually tasting it. Wonderful aroma and smooth. Great to enjoy on cool nights under the stars on the mountain. The aroma is great and it will keep warm on those breezy nights on the beach.